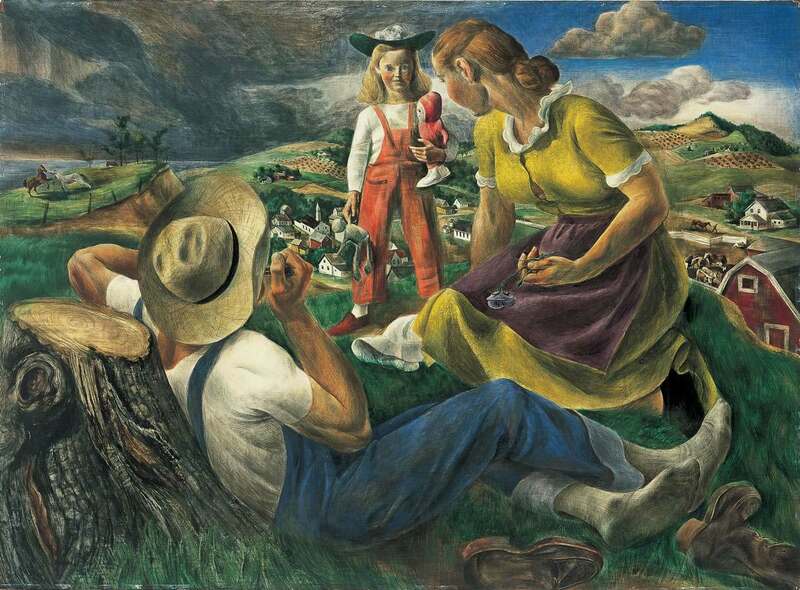 Turning to more emotionally expressive works in the 1940s, Zoltan Sepeshy used his four-year-old daughter Cecilia and his wife Dorothy as models for this painting, which employs his painstaking tempera technique (he later wrote a book on tempera painting). At first glance Sunday Afternoon-The Family appears to represent a happy nuclear family in the American Midwest. But closer examination reveals something unsettling. Sepeshy places the family atop a hill with a steep decline that leads to an ominous landscape in the background. And what is the cause of the little girl’s wide-eyed, transfixed gaze? Is she frightened by the dark, approaching storm that has caused the horses to rear, or has she interrupted an intimate moment between her parents? The bright primary colors in the foreground are contrasted with the approaching darkness of the distant clouds. The discordant atmosphere of the painting, produced during World War II, may point to Sepeshy’s concern over the effects of the European war and his hope for the future, represented by the child whose back is to the storm.